A corporate memo sent out by Apple executive Jeff Williams reveals that both he and Chief Executive Tim Cook are "deeply offended" by a report that aired on the BBC, alleging poor treatment of workers by an Apple supplier in the Far East. Williams's memo was sent out to 5,000 Apple staff members in the U.K., and a copy of it was obtained by The Telegraph. In it, the Apple senior vice president said it shared certain facts with the BBC prior to the program's airing, but those details were "clearly missing" from the special that aired on the news channel Thursday evening. 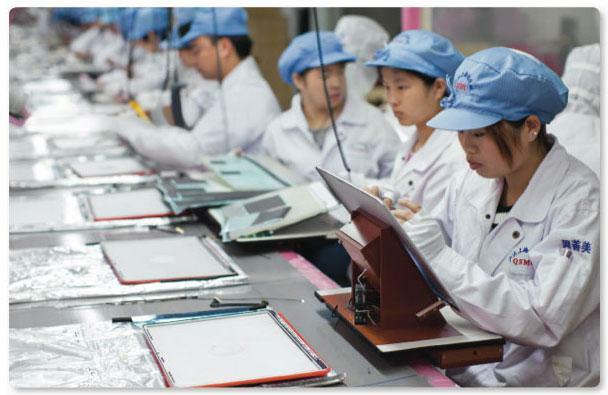 In the program, BBC One reported multiple instances of purported poor treatment of workers on a Pegatron production line tasked with assembling Apple's latest iPhone 6 handset. The investigation by BBC Panorama used hidden cameras to discover a variety of infractions violating Apple's own Supplier Responsibility report, including illegal ID card confiscation, excessive working hours, poor living conditions, and underage workers. In his email to employees, Williams said that Apple's audits and tracking show that it has achieved an average of 93 percent compliance with its 60-hour workweek limit. The Apple executive admitted that the company can do better, and vowed that it will. The note also addressed criticism that Apple uses tin from Indonesia in some of its products. In the letter to employees, Williams said Apple's team has also visited the same parts of the country shown by the BBC, and that the company is "appalled" by what it found. "Apple has two choices: We could make sure all of our suppliers buy tin from smelters outside Indonesia, which would probably be the easiest thing for us to do and would certainly shield us from criticism," Williams wrote. "But it would be the lazy and cowardly path, because it would do nothing to improve the situation for Indonesian workers or the environment since Apple consumes a tiny fraction of the tin mined there. "We chose the second path, which is to stay engaged and try to drive a collective solution." Williams's comments are similar to ones the company made in February, when it noted the electronics industry as a whole is responsible for over half of the world's tantalum consumption, but it is not a major consumer of tin, tungsten and gold. Without substantial buying power companies like Apple have little sway with smelters or collectors of those minerals. In its Supplier Responsibility report earlier this year, Apple said it planned to crack down on conflict minerals, especially those sourced from the Democratic Republic of the Congo, by releasing a quarterly report listing supplier smelters.